Siegmeyer is a knight from Catarina, who has come to Lordran seeking adventure and excitement, even if he isn't totally prepared for it and his daughter is against it. 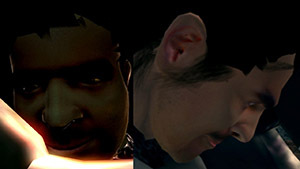 He is seen throughout the game and has various events which continue his story-line. He's often getting into trouble as he goes along, but always remains optimistic that somehow the obstacle will be overcome (usually by the Chosen Undead). He typically will be seen sleeping or meditating on his current problem, determined to continue his adventure, wherever it will take him. He's sitting outside the closed gate of Sen's Fortress. This is the earliest possible encounter with him. Note: This encounter is optional, however if you do not speak to him here or only speak to him once without exhausting his dialogue, there is a risk that it will bug the next encounter and prevent the quest from proceeding (He will sit in Sens Fortress forever, unable to speak). Sitting at the edge of a cliff, down from where the first rolling boulders are encountered, near the Shotel. Speak to him and redirect the rolling boulders away from the slope nearest to him. If you miss his first encounter, this encounter is mandatory. When you reach the high courtyard with a Silver Knight (sword) and a Silver Knight (greatbow), go through the doorway guarded by the Silver Knight (sword). He will be standing in front of the window. Kill all three Silver Knights in the room in front of him, then speak to him. He'll give you Tiny Being's Ring. Standing near the bonfire. He will ask you if you were the undead who opened the gates at Sen's Fortress. If you answer "Yes", he'll give you the Emit Force miracle. Once he leaves the Firelink Shrine for Blighttown, Sieglinde of Catarina's Golden Crystal Golem will spawn in The Duke's Archives. In the swamp, near the entrance to the area with the Server and lots of Giant Leeches. Talk to him to wake him up. He'll ask for some moss clumps. If you say "Yes", you'll give him 3 Purple Moss Clumps and he'll give you the Pierce Shield. If the four Chaos Eaters are defeated before Siegmeyer leaps down, he will give you the Speckled Stoneplate Ring and his story will not continue. If he survives the fight with less than 50% health, he appears to die from poison and drops the Speckled Stoneplate Ring and Humanity x3. His story will not continue. If he survives the fight with equal or more than 50% health, his story will continue, but you won't get the Speckled Stoneplate Ring. Final story event. He and Sieglinde will be near the first bonfire. Talk to Sieglinde to receive a Titanite Slab. If you kill Sieglinde of Catarina after you save Siegmeyer in Lost Izalith, Siegmeyer will sleep forever. His name is probably based on German. Where as sieg means "victory" and "meyer" being based on the very common surname "Meier", whose initial meaning was that of a noble landlord. Despite jumping into the poison pit in Lost Izalith, he seems immune to the poison effect which it gives the player. Despite common game logic, Siegmeyer does not become poisoned, which is something you do not need to fret over. Precautions with spells like Soothing and Bountiful Sunlight are not needed. Behind this huge and oddly-shaped armor is a real face, and if you take a look with the binoculars you may get a glance at it: Video. 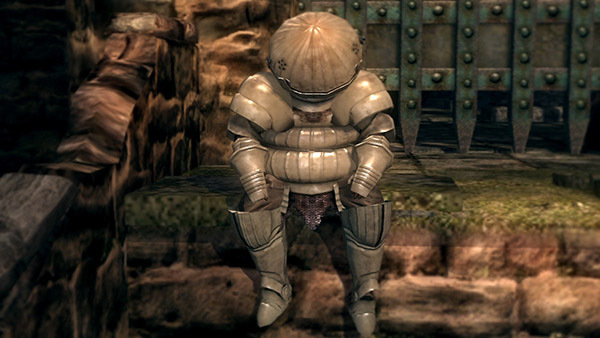 Given the characteristic glow in near-death state, Siegmeyer is in possession of one of the Tearstone rings. This is most likely the Blue Tearstone ring, as Siegmeyer, like the blue tearstone, is from Catarina. Failing to speak to him initially before ringing both bells and exhausting all his dialogue may make it impossible to interact with him in Sen's Fortress and completely ruin the remainder of his storyline (PC). If you decide to kill three Chaos Eaters (or four, if you kill the one hiding in the corner) in the Lost Izalith event to make the fight easier, and chose to leave the fourth (counting from left to right) one alive, when you talk to Siegmeyer to trigger him dropping into the swamp pit, he'll say his dialogue as if he's fighting but he'll remain in his spot and won't do anything. You can kick him into the swamp to unlock him from that state and it won't count as an aggression. After killing Siegmeyer near the ledge under Sen's Fortress his drop items were located on the next respawn in front of the Fortress where he is originally found. If you reach this area before Siegmeyer appears, don't kill all the Chaos Eaters, they don't respawn and you won't be able to complete his storyline. It is generally a good idea to use a ranged attack (a Bow or Spells for instance) to kill three of the four Chaos Eaters from above and leave one nearly dead before speaking to Siegmeyer for the third time. 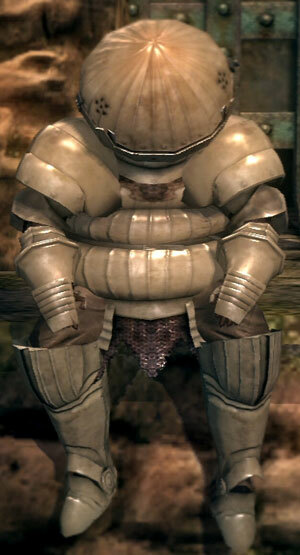 If there is at least one Chaos Eater alive when you speak to him for the third time, Siegmeyer will jump into the pit and begin to fight. You can also kill the Chaos Eater hiding in the corner. Facing in the same direction as Siegmeyer is, this Chaos Eater is hiding behind the top right corner. Find a spot where you can visualize this corner (only his tentacles should be visible) and you can use a bow to hit him from there (easier if you have the Hawk Ring equipped). There's a really easy way to take out these Chaos Eaters. If you go down the stairs on the side of the room you'll come across a pathway to the middle room with a huge pit in the middle that you can walk around. It's very easy to aggro three of the Chaos Eaters with arrows, then lead them around the corner. They will walk into the pit and die. If you leave alive the fourth Chaos Eater, counting from left to right and facing in the same direction as Siegmeyer is, when you talk to him to make him jump down, he'll stay in his spot and won't move. You can kick him into the pit to unlock him from that state and it won't count as an aggression. Make sure not to drop on top of him, in the event of him dropping into the pit before you. It will count as an attack and he will become aggressive to you. Equip the Rusted Iron Ring so you don't slow down in the swamp while fighting the Chaos Eaters. There is a fifth Chaos Eater hidden around the corner which may attack him, be wary of that. Or, a gate, I should say. The thing just won't budge. …Or, a ball, to be precise. so here I sit in quite a pickle. Bah, no chance. My head would spin. Let me guess. Were you repelled by the Silver Knights? Aww, don't be ashamed. 'Tis the fate of vanguards like you and I.
I'll think of something. We can overcome this, together! What's on your mind friend? Wait!… You defeated those monsters?! Fantastic…I am saved. This Knight of Catarina hereby commends you! Take this as a token of my gratitude. but be warned, gallantry entails great risks. Well! Fancy meeting you here. You did much for me up above. I am grateful. It seemed like an unlikely coincidence. Please take this, as a token of my gratitude. Oh well. Stranger things have happened. You only have to give it some time! I'll be heading down below shortly. There's nothing worthwhile up above. No worries! Adventuring is my life; I'm prepared for the worst. Excuse me. I was so absorbed in thought, I just drifted away. You see, I'm actually in a bit of a fix. I've made it this far, but I'm short on antidote moss for the trip back. But can you spare a few scraps of moss? Thank you, a saint you are. This knight of Catarina expresses his deepest gratitude. I shall not forget this. Please, take this; a symbol of my appreciation. Well, our fates do seem entwined, don't they? Perhaps this, too, is the will of Lord Gwyn! I'll be fine. I can make it without that silly moss. Think about it. Have I ever let a little hardship slow me down? It must be the warmth. Well, what's on your mind? No, don't tell me. Those monsters making life difficult for you? You need not be ashamed. We are in the same boat. …You know, I really have run up quite a debt to you. Friend, I have an idea. A good one, really. … I will ruse those dire fiends, and you can slip away in the confusion. Please, friend, I owe you much more than this. By the honour of the knights of Catarina, allow me to assist you. And now, I go! Don't be slow! C'mon! Over here, you fiends! I am Siegmeyer of Catarina, and you shall feel my wrath! But, you! Didn't you get away? I think I'll have a rest. Don't you worry, the ground below me is my pillow. Wait!…Did you defeat those dire creatures? Outstanding…You never fail to impress. Well, wonderful. This knight of Catarina thanks you. Take this, as a token of my gratitude. I curse my own inability. That's your game, is it? Well, I'm certainly not backing down! By the honour of my knighthood!